New Glover Park restaurant Arcuri is noted for its limoncello, a liqueur that’s made on the premises and consists traditionally of lemon peels, sugar and grain alcohol. Arcuri’s team is set on inventing new flavors by using a variety of fruits, spices and sugar. For example, on December 17, the restaurant will offer a clementine-flavored liqueur; on December 23, an eggnog-flavored liqueur; and on December 30, a beverage titled V Cello with mint, anise, jalapeños, lemon and sugar. These experiments continue until the end of January. Each shot glass costs $5. Lunch Mon.-Fri., Dinner nightly, Brunch Sat.-Sun. Arcuri, 2400 Wisconsin Ave. NW, Washington, DC 20007, 202-827-8745. After closing her popular Bangkok Joe's contemporary Thai eatery, chef Aulie Bunyarataphan has reopened the site with another Southeast Asian-focused venue, named after her grandmother. At Mama Rouge Southeast Asian Bistro, the chef has tempered the traditional heat to appeal to modern American palates, but has still retained the flavors and regional influences that have popularized the cuisines of Southeast Asia. Look for a mix of Burmese, Thai, Chinese and even French flavors in the dishes. Mama Rouge Southeast Asian Bistro, The Washington Harbour, 3000 K St. NW, Washington, DC 20007, 202-333-4422. The James Beard Foundation's Celebrity Chef Tour will stop in Washington, D.C., at Del Campo on February 11, 2015. Participating chefs will include host chef Victor Albisu, Jamie Bissonnette (​​Coppa, Boston; Toro, Boston and NYC) and Scott Drewno (The Source by Wolfgang Puck, Washington, D.C.), among others. The event will start at 6:30 p.m. and costs $195 per person. For more information, visit www.jamesbeard.org. Del Campo, 777 I St. NW, Washington, DC 20001, 202-289-7377. Bibiana Osteria-Enoteca’s beverage director has come up with a list of inspired drinks for celebrating the Christmas season. Patrons can sip on such treats as mulled wine, spicy hot chocolate with brandy, and a hot-and-cold gin fizz, among many others introduced each night until Christmas Eve. The kitchen will be offering assorted Italian snacks at the bar or in the lounge, including lamb ribs glazed with sherry vinegar and fried artichoke hearts with parsley. Cocktails are priced at $12 each. 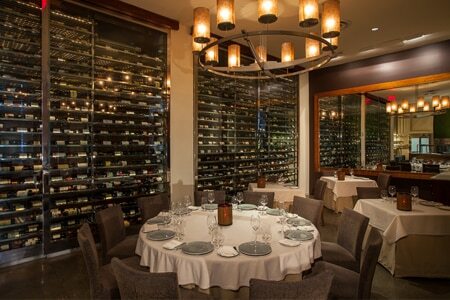 Bibiana Osteria-Enoteca, 1100 New York Ave. NW, Washington, DC 20005, 202-216-9550. Following the recent departure of chef Nicholas Stefanelli from Bibiana Osteria-Enoteca, Jake Addeo takes over the kitchen of this popular Italian restaurant. Addeo has 16 years of restaurant experience, including working in both New York City at Abboccato Italian Kitchen and Felidia before moving to Hong Kong. There he served as executive chef at Trattoria Doppio Zero for three years. He was also executive chef of BLT Steak in Hong Kong. Bibiana Osteria-Enoteca, 1100 New York Ave. NW, Washington, DC 20005, 202-216-9550. CityZen at the Mandarin Oriental, Washington DC closed December 6, 2014. Hotel management reports that a new restaurant concept will take the CityZen space in the future. CityZen chef Eric Ziebold is striking out on his own with a new restaurant opening near the Mount Vernon Triangle in DC. CityZen, Mandarin Oriental, Washington DC, 1330 Maryland Ave. SW, Washington, DC 20024, 202-787-6148.